In this post we examine 5 of the best-selling Oracle certification courses on Udemy. Oracle is the most recognized vendor in the IT market whose main product is its relational database management system dubbed the Oracle Database. Udemy’s inexpensive Oracle courses help students learn this system and become proficient in its implementation (Source). Experts recommend choosing an operating system you’re comfortable with before embarking on a career with Oracle as this will make it easier when you don’t have to learn a new OS on top of the new information (Source). Most Oracle systems are installed on UNIX or Linux systems, and experts strongly recommend learning those (Source). If you're trying to pass the Oracle Database SQL and 1Z0-071 exams, check out this course. If you're looking to become an Oracle database administrator, check out this course. If you're trying to become a certified SQL developer, check out this course. In this article, we’re going to look at 5 Oracle courses offered by Udemy, which specializes in online training courses. The first course we looked at is the Oracle 11g Certified Professional Exam Prep course. This course is part one of three to get students the professional certification they need to begin installing software, creating databases and managing security. Students who took the course praise the clear instruction, but some say the course should have focused on the Linux/Unix environment as opposed to Windows Server. • Next up we looked at Oracle Database 12c SQL Certified Associate course. This course is designed to prepare students to pass university Oracle Database SQL and 1Z0-071 exams. As with the previous course, this one works primarily in the Windows operating system. 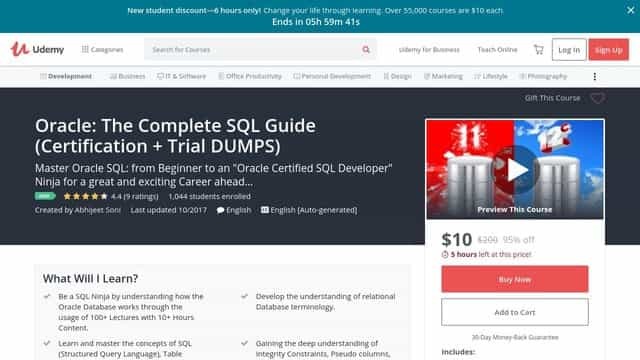 With 166 lectures, this is one of the most comprehensive Oracle courses offered by Udemy and students praise the teacher for being available to answer questions give help when needed. The few critics seem to focus on the lack of quizzes and practice assignments. • Next is the Oracle DBA 11g/12c Database Administration for Junior DBA course. This course promises to allow students to learn to become a Oracle Database Administrator in 6 weeks with the goal being on getting employed in this industry at the entry level. Students taking this course should already have knowledge of basic SQL and Unix/Linux commands. The teacher is well-qualified with a Masters Degree in computer science and students say the course is clear and the demonstrations are easy to understand. • The Oracle Complete SQL Guide (including SQL Certification) is the next course we looked at. This course advertises taking a student from beginner to “Oracle Certified SQL Developer”. What impressed us is the depth with 100 lectures and over 10 hours of content, students say it covered all the important concepts of Oracle SQL. It’s also worth mentioning that participants need not have any prior programming experience to take this course. • Lastly, we looked at The Complete Oracle SQL Certification Course, which Udemy lists as a “Best Seller”. This course promises to teach you SQL language and make you “job ready”. Students need not have any prior programming experience for this course and prior students back this up by praising the teacher for being organized and explaining concepts clearly. The main criticism is the lack of practical assignments to practice what you’ve learned. If you are looking for a top-rated online Oracle certification course, you might want to consider the Complete Oracle SQL Certification Course. Students love the thoroughness of this course, but do suggest adding more exercises to help you learn the explained concepts. The goal of this course is to teach you some seriously marketable programming skills that are necessary for solving a variety of database problems. It was designed by Imtiaz Ahmad, founder of Job Ready Programmer, who states that the lesson will prepare you to be job-ready in just 1 month. This Oracle SQL course might be a good choice for individuals willing to get into software development career. In general, students have a very favorable opinion of the Complete Oracle SQL Certification Course. They agree that the content of the lessons is great, as well as that the explanations are clear. Students appreciate that the instructor is very organized and thorough. However, students agree that the course could do with more exercises as you go through the material. The Oracle – The Complete SQL Guide (includes SQL Certification) is a solid option for those who want to learn how the Oracle Database works and become a SQL Ninja. Students like the straightforwardness of the material, and so far have no complaints. This online Oracle SQL course is suitable for those who want to learn the coding language that is used for managing data in relational database management systems. The founder of the course, Abhijeet Soni, states that the lessons give powerful insights into concepts that will help you become a database developer quickly, such as Integrity Constraints, Pseudo columns, Joins, and Queries. This course could be a solid choice if you want to learn SQL for getting proficiency in relational database operations. In general, students state that the Oracle – The Complete SQL Guide meets their expectations. They agree that the course is straightforward and understandable, as well as that the lessons offer in-depth knowledge and great explanations. In our research, we haven’t come across any negative feedback. 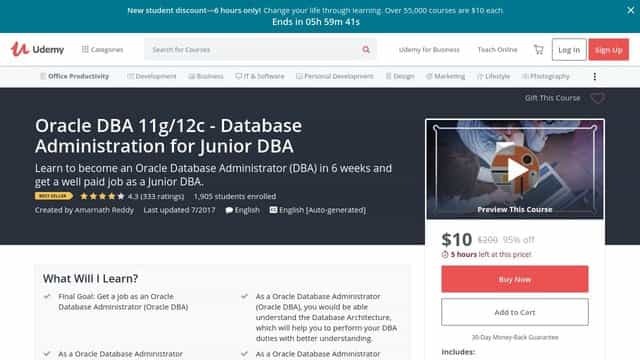 The Oracle DBA 11g/12c – Database Administration for Junior DBA is a solid option for those who want to get a job as an Oracle Database Administrator (Oracle DBA). Students love the structure of this course, but some say that it should include more topics. The goal of this course is to help you understand the Database Architecture and prepare you for a Junior DBA position in 6 weeks. As the instructor Amarnath Reddy, Oracle Architect, says,the lessons cover both Oracle Database 11g and Oracle Database 12c so that you get to know the differences and can work in organizations who are still in 11g. This course might be a solid choice for individuals who have basic SQL knowledge and basic UNIX/LINUX commands and are willing to start their career in Database Administration. The general student consensus concerning the Oracle DBA 11g/12c – Database Administration for Junior DBA is that it is well-structured and easy to understand. Students appreciate that the instructor gives clear explanations and great instructions. However, some students state that the course needs to cover more topics. The Oracle Database 12c SQL Certified Associate 1Z0-071 could be a good option if you are a junior programmer who wants to find better jobs by gaining Oracle certification. Students like that the lessons are detailed and thorough, but there are complaints regarding the instructor’s English. The goal of this course is to prepare you to pass Oracle Database SQL 1Z0-071 and Oracle Database 12c: SQL Fundamentals 1Z0-061 exams. The lessons were designed by Khaled Alkhudari, Udemy Top-Responder. This course might be a good choice for individuals who want to be experts in Oracle database 12c Architecture. In general, students have a good opinion of the Oracle Database 12c SQL Certified Associate 1Z0-071 and they conclude that it is a precise, in-depth and very detailed program. Many online reviewers appreciate that it has many concrete examples that illustrate the concepts, as well as that the lessons are well-paced. In addition, they find the lecturer to be very responsive. However, several students complain that the instructor’s English is very bad and that he seems to read from the slides instead of explaining things. If you’re looking for an online Oracle certification course, you might want to consider the Oracle 11g Certified Professional Exam Prep I. Students like the detailed coverage of the lessons, but some wish it was explained in Linux env. The goal of this course series is to provide the student with all the skills needed to pass the Oracle Certified Professional 11g DBA Exam. Designed by Dave Haas, Senior Oracle DBA/Instructor, the course is said to help you advance your career in the IT field. This course seems like a good choice for those interested in gaining a deeper understanding of Oracle Database in order to achieve certification. The general student consensus concerning the Oracle 11g Certified Professional Exam Prep I is that it is very informative, detailed in coverage, well-paced, well-organized and clear in presentation. However,some students complain that those who are working in the Linux/Unix environment have to figure out the different file paths and environmental differences on their own. Therefore, they find that pointing out these differences in key areas would be helpful for the vast majority of Oracle hacks who are working in the *nix environment. The Oracle Database (also typically referred to as the Oracle RDBMS, or just Oracle) is a database management system based on object-relational architecture. It is produced and marketed by the Oracle Corporation. Back in 1977, Larry Ellison and two of his co-workers, Ed Oates and Bob Miner worked together to start a consultancy firm that was initially called 'Software Development Laboratories' (SDL). This firm designed and developed the initial version of the Oracle database software. The word 'Oracle' was chosen because it was originally the code name of a project that Ellison had worked on for the CIA back when he was an employee of Ampex. The decision about whether to get certified with Oracle or not has been an issue that has been debated for quite some time now. However, it cannot be denied that having an Oracle certification gives a clear indication of the technical prowess of the certified individual. Being certified with Oracle also gives you an advantage over other people who are competing against you in any job vacancies that demand a knowledge of database administration. In order to get certified with Oracle, candidates have to prove their knowledge and skills on all things related to Oracle technologies and products. Oracle certifications and credentials are awarded to candidates based on their performance on various exams and performance and training based assignments, depending on what level of certification they are aiming for. One thing is certain, getting an Oracle certification gives one a noticeable and tangible standard of expertise and experience, which will help in standing out from the rest of the people who are not certified in the eyes of potential employers. There are over 200 different certifications offered by Oracle that cover various areas, such as cloud computing, operating systems, database management, application development, virtualization, enterprise management and much more. In this article, we will attempt to guide you on how to get started getting certified with Oracle so that you can attain Oracle credentials and greatly enhance your possible career growth paths. To begin with, there are 6 main levels of Oracle Certification Credentials. These are; Oracle Certified Junior Associate (OJA), Oracle Certified Associate (OCA), Oracle Certified Professional (OCP), Oracle Certified Master (OCM), Oracle Certified Expert (OCE) and Oracle Certified Specialist (OCS). These credentials cover over 9 different pillars of technology and they are further divided into various product groupings and families (Source). These certifications are also defined by different job roles that are outlined on the Oracle Certification website. The first certification is the Oracle Certified Junior Associate (OJA) credential and is a beginner level certification that mainly focuses on students who are in secondary schools or two and four year college degree courses, as well as members of faculty who specialize in teaching computer science classes and foundational Java programming (Source). The next step in the certification process is the Oracle Certified Associate (OCA) credential, which is needed to obtain the much coveted Oracle Certified Professional certification. The OCA credential makes sure that the candidate who has it has the basic fundamental skills needed to work with Oracle products. After that, the Oracle Certified Professional (OCP) credential builds on top of the skills learned in the OCA certification. The OCP will have a firm command over certain areas of Oracle products and technologies and will have a higher amount of skill level and knowledge as compared to the OCA. OCP credentials are mostly used by IT managers to judge and evaluate the qualifications of potential job candidates and employees. After the OCP credentials comes the Oracle Certified Master (OCM) credential. This certification is a demonstration of the top most level of skills and abilities needed to work with Oracle products and technologies. The OCMs are talented enough to be able to solve the most complex and difficult IT database related problems. Getting this certification is extremely hard and difficult and candidates have to pass through a gauntlet of rigorous exams based on skills and performance. This certification builds skills on top of the skills and knowledge gained in the previous OCA and OCP certifications. The Oracle Certified Expert (OCE) credential is used to put candidates into specific, niche oriented architectures, domains or technologies and recognizing their mastery in that niche. The OCE credentials are not related to the more common OCA, OCP and OCM credentials, but they do typically involve further specialization into the skills learned and proven in the OCA and OCP credentials. There are various specializations that fall under the umbrella of the Expert program and they vary greatly, ranging from mastery of advanced database technologies to basic foundational skills. Finally, the Oracle Certified Specialist (OCS) credentials are the implementation oriented certifications that are targeted at current employees of companies that are presently the partners of the Oracle Company. However, this certification is available for all candidates, whether they are partners of Oracle or not. The OCS certifications focus on very specialized skillsets and are used as a measure of a candidate's level of skill, talent and expertise in a particular field. A database made in the Oracle system is a mixture of data that is treated as a single unit. The main goal of a database is to store data and retrieve related information about trends, patterns etc. For most information management problems, a database server is the main component that keeps the information in an ordered manner. Generally speaking, a database server has to reliably manage a huge amount of data in an informational environment that is being used by a number of people, which allows all these people to access the data at the same time. All this has to be achieved while providing high performance and high processing speeds. Database servers are also used to prevent information from falling into the wrong hands by not allowing unauthorized users access to specific portions of data. These database servers also provide quick and efficient solutions in case of a failure to recover particular pieces of data. The Oracle Database was the first database system that was designed to work with enterprise grid computing in a cost effective and flexible manner that allowed users to easily and conveniently manage various applications and information. Enterprise grid computing led to the creation of huge amounts of modular storage servers and set the industry standards for years to come. It also eliminated the need for peak workloads as the capacity of the servers could easily be increased or decreased according to the requirements of the time. The Oracle Database system has both logical and physical structures. Since the physical and logical structures are separate from each other, the physical storage of data can be easily managed without hindering or affecting access to the logical storage structures.